Electricity Usage Monitor Kill-A-Watt? [ElctrcityMonitr P3IP4400(149526)] - $29.95 : NewDaVincis.com!, Great Innovative Products, Gadgets and more. Home :: Home, Houseware & Garden :: Home Products :: General Home Products :: Electricity Usage Monitor Kill-A-Watt? This product was added to our catalog on Monday 06 July, 2009. 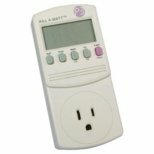 Notify me of updates to Electricity Usage Monitor Kill-A-Watt?